You can view all replies in a discussion by scrolling or searching content. Focused discussion replies are shown in hierarchal order; threaded discussions are hierarchal, collapsable, and expandable. In a discussion, you have several options to view and sort discussions. 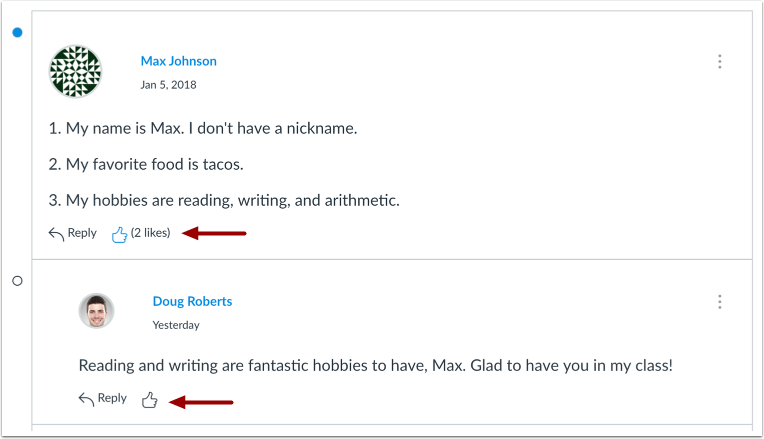 Use the search field  to search for replies or specific authors. To filter by unread replies, click the Unread button . You can also collapse and expand  all discussion replies. To subscribe to a discussion, click the Subscribe button . Subscribing to a discussion allows you to follow the discussion and receive notifications as set in your notification preferences. You are automatically subscribed to any discussions you reply to. When you create a discussion in a group—or in a course if you have permission—you are also automatically subscribed to the discussion. If you are subscribed, the button will have a green background. To unsubscribe, click the Subscribe button and the background will turn gray. To open options for the discussion, click the Options button . Options allows you to mark all existing posts (replies) as read. 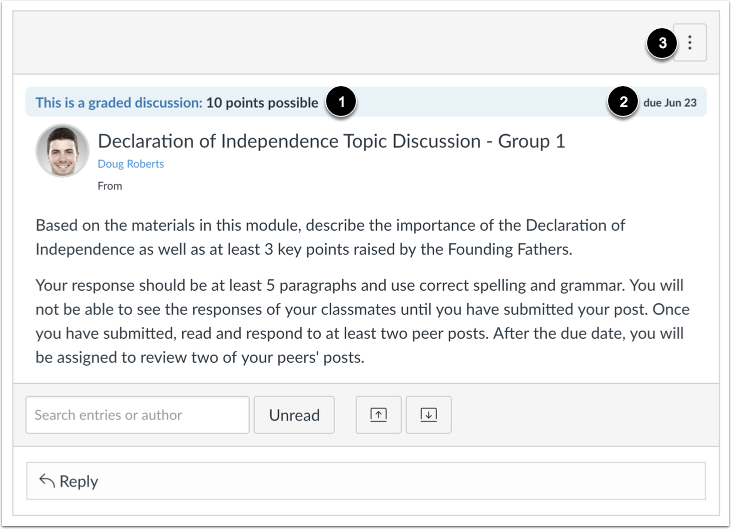 If your discussion is graded, you can view the rubric for the discussion, if any. You can view how many unread and replies are in a thread . The number on the left indicates unread replies, while the number on the right indicates the total number of replies. 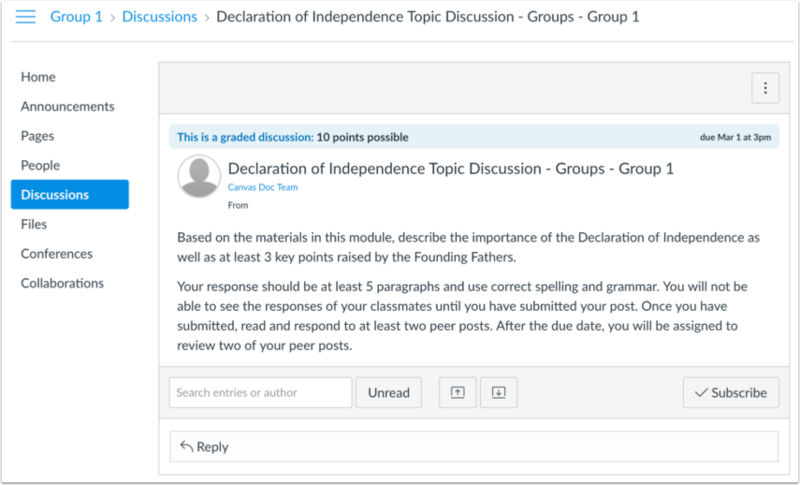 If your discussion is a graded discussion, you can view the discussion the same way as regular discussions. However, you can view the number of points the discussion is worth , and if there is a due date . 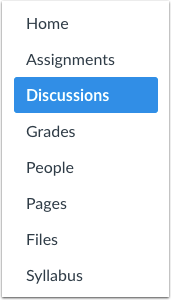 The Options button  will show the rubric for the graded discussion, if any. If a discussion is a group discussion, you'll be redirected to Discussions for the appropriate group. Discussion replies are shown in order of post date. In discussion replies, the unread icon indicates the reply is new and unread . The read icon indicates a reply is read . When you navigate away from the Discussion or refresh the page, Canvas automatically marks the replies as read. 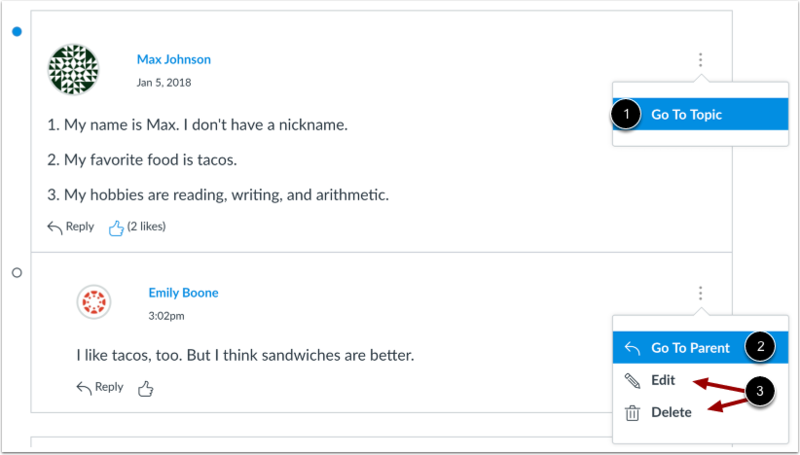 After Canvas has changed the reply status, you can manually mark discussion replies as read or unread at any time. You can also change your Discussion Settings so you can manually mark discussion replies as read. Threaded Discussions are discussions with replies within replies. 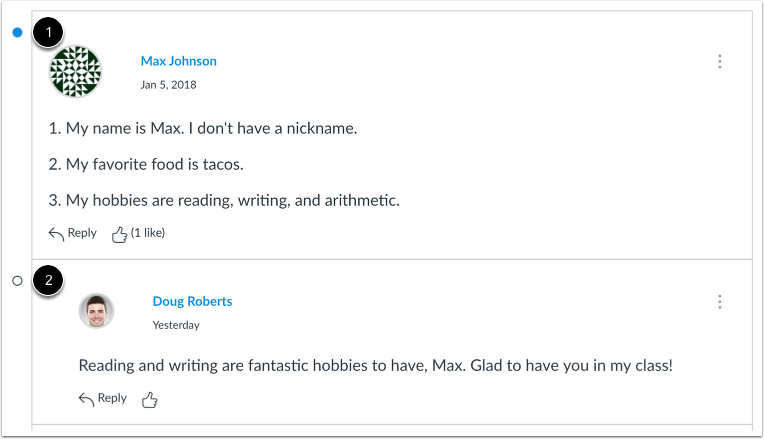 In addition to post date, replies are shown in hierarchal order, with replies naturally indented to indicate when a student replies to another student's reply. When viewing threaded discussion replies, you can collapse and expand individual threaded discussions. Hover over the top of a discussion reply and click the up arrow to expand or collapse a threaded discussion reply . When a threaded discussion reply is collapsed, you can view the reply indicators showing the number of unread and total replies . 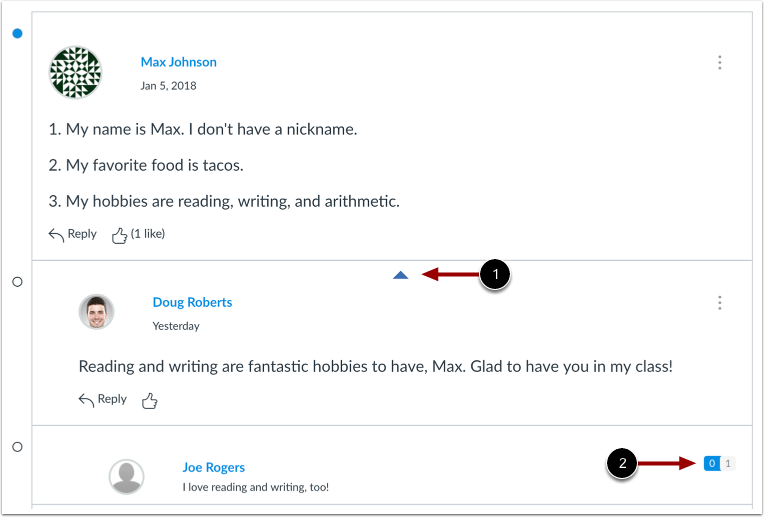 If your instructor allows you to like replies in a discussion, a Like icon appears next to each reply in the discussion. Blue icons indicate replies that you've liked. The number of total likes also appears next to the icon. The discussion may also be set up to sort automatically according to the number of likes. In threaded discussions, likes are retained with the original discussion reply. Original replies will always sort first, and any associated replies will be reordered beginning with the highest-liked reply. Each discussion reply has its own options menu. 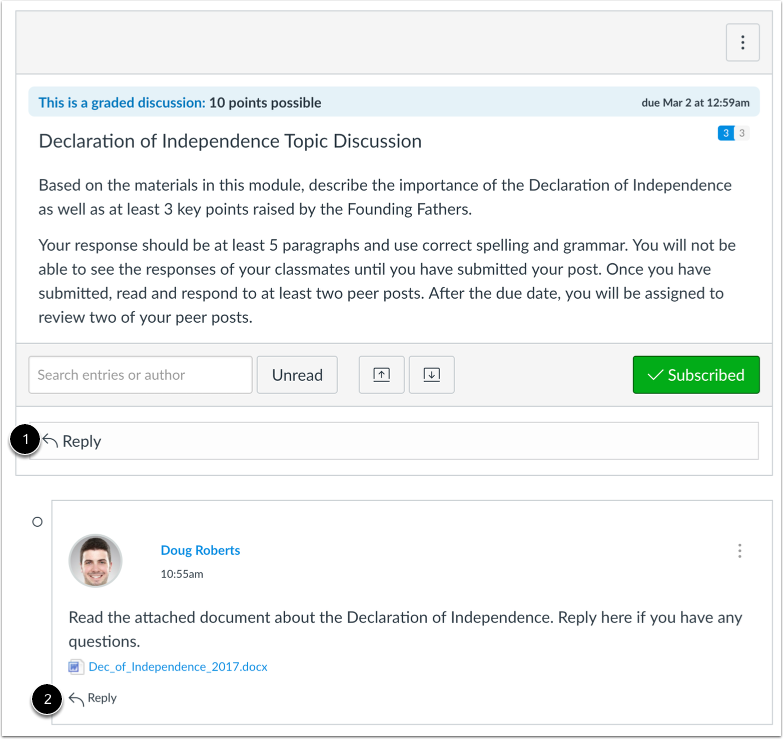 In original discussion replies, you can return to the main discussion topic by clicking the Go to Topic link . In threaded discussions, if you are viewing a reply within a reply, return to the original reply by clicking the Go to Parent link . If you are allowed to edit and delete your own discussion posts, you will also view Edit and Delete options . To reply to a discussion, reply to the main discussion topic by clicking the Reply field . If your discussion is threaded, you can reply to any other post in the discussion by clicking the Reply link . Previous Topic:How do I subscribe to a discussion as a student? 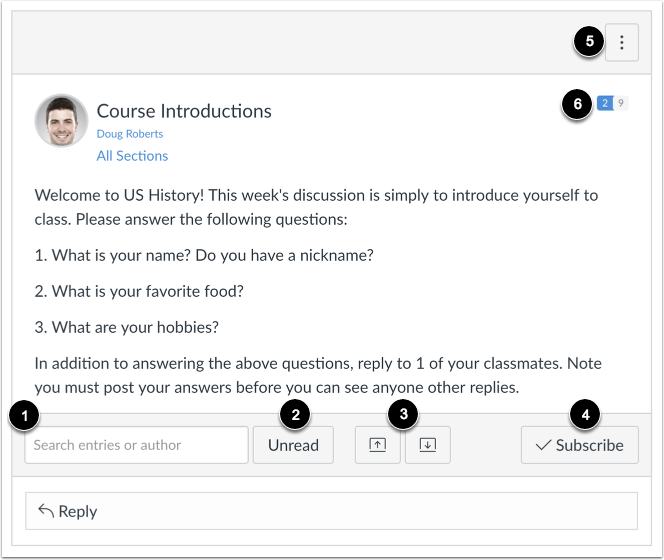 Next Topic:How do I change discussion settings to manually mark discussion replies as read as a student? Table of Contents > Discussions > How do I view and sort discussion replies as a student?